From one of our finest poets comes a collection about time--about memory, remembrance, and how the past makes itself manifest in the world. Called "the poet of things" by Richard Howard, Don Bogen understands the ways objects hold history, even if they've grown obsolescent, even when they've been forgotten. So objects--rendered in cinematic detail--fill these poems. A desk, a mailbox, a house delivering its own autobiography. Hospitals: the patients who have passed through, the buildings that have crumbled. And, in a longer view, the people who survive in what they left behind: Thom Gunn, Charles Dickens, and the pre-Columbian architects who designed the great earthworks of Ohio two thousand years ago. Songs, ephemeral by nature but infinitely repeatable, run throughout the collection. "What did they tell me, all those years?" Bogen writes. 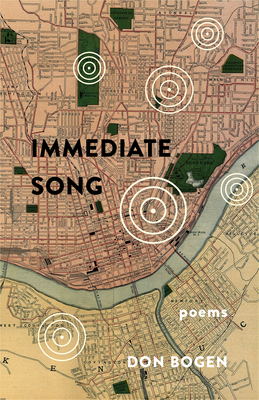 Immediate Song offers us a retrospective glance that is at once contemplative and joyous, carefully shaped but flush with sensuous observation: a paean to what is both universal and fleeting.